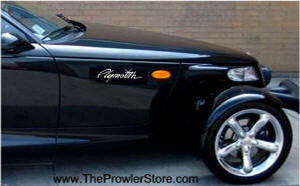 ACC-822017-SM Plymouth Prowler Deluxe Stainless Steel Side Panel "Prowler" letters Insert - Mirror Polish. Highest Quality Upgrade. 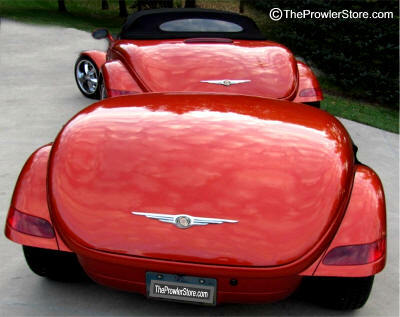 One odd thing about the Prowler is that it doesn't say Prowler anywhere on the car. Many people have come up to me walked around my Prowler and asked what kind of car is this! These emblems are real pure high quality Stainless Steel high polished and laser cut to fit perfectly on your side panel. These bright shiny pieces really pop out! What a difference! Easy installation. Letters not sold individually. 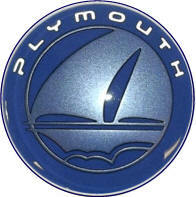 ACC-822016-SM Plymouth Prowler Deluxe Stainless Steel Side Panel "Plymouth" letters Emblem - Mirror Polish. Highest Quality Upgrade. Factory stock hood emblem for Prowler years 2001-2002. Difficult to find. New original from Factory. Can be mounted anywhere! Includes mounting tape on the back. Simply peel and stick. Comes in Polished Steel with Black background. This item contains one (1) Emblem as shown. 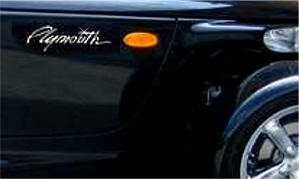 Factory stock hood emblem for Prowler years 1996-2000. Difficult to find. 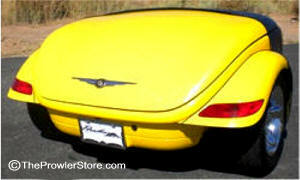 Many Prowler Owners like the look of the elegant and famous Chrysler Wings emblem on the backside of their Kats'. 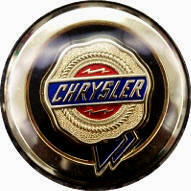 These are Brand-New factory made emblems that were made for Chrysler cars. The reason these are used for the Prowler is the size and fit is right. The back of the emblem has been modified and fitted with professional car body adhesive tape. Simply peel and stick for a permanent bond. One(1) Chrysler original factory made wings emblem ready to mount. inches through the center of the oval. 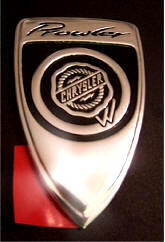 Many Prowler Owners like the look of the elegant and famous Chrysler Wings emblem on or in their Kats'. These have bee modified include 3M automotive taped backs. The reason these are used for the Prowler is that their size makes them ideal to accent interiors on exteriors. Use your imagination they have a 101 uses. The back of the emblem has been modified and fitted with professional car body adhesive tape. Simply peel and stick for a permanent bond. Stick it Anywhere - Inside or Outside! 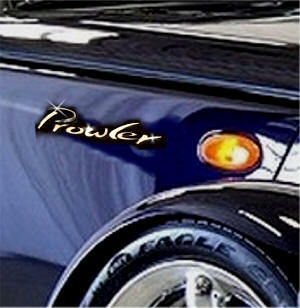 Chrome vinyl emblem Horse Power rating for Prowler years 1997-2002. Simply peel and stick. Size: 1/2" x 5 3/4". Heat resistant will work on top of engine as well. 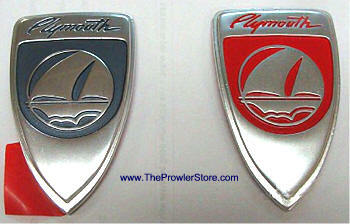 Chrome hard automotive plastic emblem Horse Power rating for Prowler years 1997-2002. 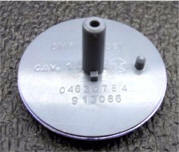 Genuine Chrysler factory part. Attach to engine, body or interior for a little unique flash. Size is 3 3/8" x 1 1/8". Includes one emblem as shown. Plastic original factory part. Has flat back with automotive double sided tape. Can mount it outside or inside anywhere you like. Approximately 2" in diameter. Cut the plastic post off the back and apply double face tape and then mount it anywhere. Cut the plastic post off the back, add double face (found at any hardware dept.) tape and stick it anywhere. 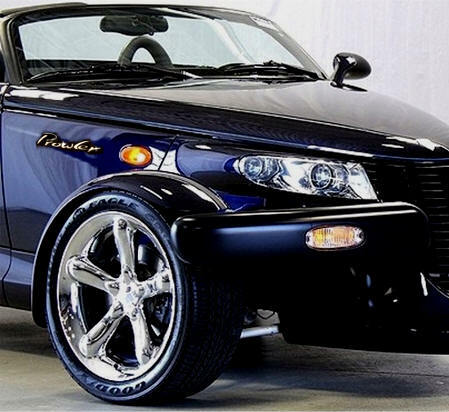 Some Prowler Owners like the look of the Classy and famous Chrysler medallion. 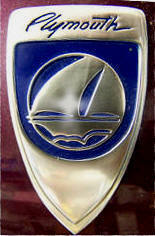 We offer two kinds brand new OEM emblems - Oval and Round. Use them to mount on the inside or outside of your Prowler! The back of the emblem fitted with professional car body adhesive tape. Simply peel and stick for a permanent bond. We offer two kinds Oval and Round. Use them to mount on the inside or outside of your Prowler! 2.5" diameter X 1/4" high.